An OK cozy mystery. Starting in the middle of a series is hard. Maybe if I had read the first two I would have enjoyed it more. The two young boys held my attention, as did the quirky town. A light and enjoyable read. 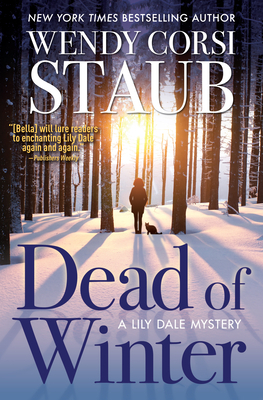 Just as a murderer dumps his corpse into the lake across Valley View in Lily Dale, Bella Jordan happens to be at her window, not quite realizing what she's seeing. Unbeknownst to her, the killer spots her silhouette and prowls straight to her door. That is, until he's interrupted by a black cat. A superstitious gambler, he takes off, but Bella's seen too much, and he vows to return. New York Times and USA Today bestseller Wendy Corsi Staub is the award-winning author of more than eighty novels and has twice been nominated for the Mary Higgins Clark Award. She lives in the New York City suburbs with her husband, their two sons, and a rescued stray cat named Chance. This is her third Lily Dale mystery after Nine Lives and Something Buried, Something Blue.